A punjabi folk song sung and composed by Daler Mehndi, with lyrics written by Gulzar. Star Cast: Harshvardhan Kapoor, Saiyami Kher, Art Malik, Anuj Chaudhary, Om Puri, K K Raina. The audio of this song is available on YouTube at the official channel T-Series. This audio is of 0 minutes 32 seconds duration. 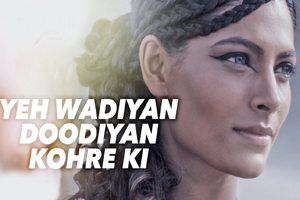 Lyrics of "Yeh Wadiyan Doodiyan Kohre Ki"
Lyrics in Hindi (Unicode) of "ये वादियाँ दुधियाँ कोहरे की"